On the afternoon of Jan. 12, 2010, Famfan Jean Arnold was at work attending to his driving school business when a deadly quake rocked Haiti. He rushed home in a panic, fearing the worst for his family. He found his house in rubble — but his wife and young children were alive and unharmed. Suddenly homeless and staggered by the scope of the disaster (more than 300,000 Haitians were killed) Arnold lost his business. His family lived for a time in a tent. Still, thanks to his faith and grit, he never lost hope. He believed better days would come. Today Arnold lives in a small but sturdy new home east of Port au Prince. A member of the Church of Jesus Christ of Latter-day Saints, he said his religious conviction provided him hope at a moment defined by hopelessness. 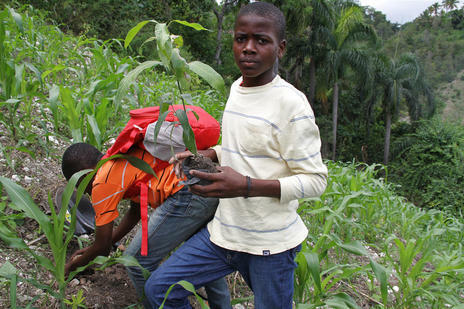 On Wednesday, he worked alongside fellow Mormons in Haiti during a church sponsored, nation-wide tree planting project designed to deliver hope and beauty to his damaged nation.